August 1972 found Elvis back at the Hilton for his 7th Las Vegas season. The year had certainly been an emotional roller-coaster ride. Starting with the low of Priscilla & Lisa’s departure on New Year’s Eve, Elvis then had to rise to the challenge of the ‘On Tour’ documentary as well as his June Madison Square Garden concerts. So it shouldn’t be surprising if Elvis’ Las Vegas shows were a little low-key and uninspired. How could he be interested in twice-nightly shows & Dinner audiences when he had just conquered New York and astounded audiences of up to 20,000 while On Tour? In a positive move Elvis added 2 new songs to his line up, ‘What Now My Love’ and ‘My Way’, as well as adding the excellent ‘Fever’ live for the first time. Elvis had recorded ‘My Way’ in the studio the previous year but it was a low-key affair. Inspired by an audience however, it would become a perfect concert choice. By now it was publicly known that Elvis and Priscilla had separated, which he even mentioned to the Las Vegas audience. While Elvis would never return to the dynamic action of 1970 he boosted the musical depth of his performances during 1972 by using a powerful & varied selection of songs that helped show off his richer voice, as well as introducing added Karate moves. It was during this season that Elvis spent some time with a very young Cybil Shepherd but it was Linda Thompson who was by his side the most. While Elvis had recorded ‘Burning Love’ back in March, and tried it out during ‘On Tour’, it wasn’t released until August and Elvis unfortunately didn’t sing it during this season. 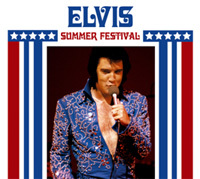 ‘Summer Festival’ features the unreleased Dinner Show performance of August 11th as well as two sensational tracks from the Midnight Show (as on the Bootleg ‘Elvis At Full Blast’) plus another 5 songs from August 12th Midnight Show. It’s an incredible 74 minutes packed with 29 songs. This is a soundboard recording and as a big plus it is from a mono reel-to-reel tape. This means that it has a much richer sound (Jerry Scheff’s bass rocks out) compared to the cassette releases of ‘Taking Tahoe Tonight’ or ‘Impossible Dream’. However a big negative is that whoever recorded the show let the needles hammer into red/overload during loud sections of the show. This means that on the loud peaks of ‘Suspicious Minds’, ‘What Now My Love’ or ‘Loving Feeling’ it sounds like your speakers are distorting (whatever Hi-Fi system you have) which automatically makes you need to turn the volume down to compensate. This is a great shame as the audio quality otherwise is much better than ‘At Full Blast’ and Elvis’ voice is also nicely raised in the mix. Not only that, but the two tracks taken from ‘At Full Blast’ have also been greatly improved. Strangely there is also a lot of variation in level & echo and ‘Until It’s Time For You To Go’ appears to come from a different tape source. Ernst however assures us that this is the complete tape as presented to FTD and the changes are due to Elvis’ sound engineer playing with the mix during the show. The striking CD cover design features Elvis in his Blue-Swirl jumpsuit and giving a cheeky sideways glance. He also looks far more tanned & trimmer than he does in ‘On Tour’. With some nice memorabilia, along with a photo of The Colonel’s tacky line of Hound Dogs display, it nicely reflects the brashness of the ‘Summer Festival’ concept. But it is the new songs that really interest Elvis and ‘Until It’s Time For You To Go’ his most recent US Top 40 single (#5 in the UK!) is delicate & delicious. Elvis soaks in the meaning of the lyric adding, "Oh, Lord, Lord, Lord" and the orchestra is well-placed in the mix. (In the ‘On Tour’ releases the orchestra is almost absent). ‘You Don’t Have To Day You Love Me’ & ‘You’ve Lost That Loving Feeling’ follow but the distortion becomes apparent & annoying on the final audio peaks. ‘Polk Salad Annie’ gives Elvis a chance to rock out which he takes at a cooler tempo than when playing to the larger ‘On Tour’ crowds. Great to have a reel-reel to hear Jerry’s bass playing on this one. Elvis obviously throws in some Karate moves, he’s having fun, and he finishes with a whoop & a laugh. It isn’t until now that Elvis welcomes the audience at this point and he’s in fine form, teasing both the crowd & the band. Although it is the Dinner Show Elvis says, "We’re gonna do our best to entertain you this afternoon." He also implies the gaudiness of the Summer Festival display saying, "My name is all over the place, in the bathrooms, on the floors and the ceilings!" Elvis then stops the band at the start of ‘What Now My Love’ with, "That’s one of the worst intros I have ever heard in all my years in show business – that takes the cake! Try it again!" ‘What Now My Love’ was first performed the previous week and Elvis shows his enthusiasm for the new song. Taken at a slow tempo compared to later versions Elvis sings with a very measured rendition of the lyrics adding heartfelt meaning, (even if he slips up on the lyrics!). However the lack of audio compression on the mix pushes the audio into tape distortion at the very end which is a shame. You’ll find yourself adjusting the volume a fair bit on this CD. Surprisingly ‘Fever’ was not yet a standard concert song (also first performed the previous week) and this version is the only official release we have of it from 1972. This first official live version is a very cool finger-clicking take compared with the later over-blown renditions, no distortion here and it sounds great. Elvis plays with the lyrics, even remembering the "Romeo Loved Juliet" verse too. Oddly by the evening show he would change & use the regular "Pocahontas" verse instead. There’s a very nice dynamic here, the Aloha version sounds positively rushed in comparison, and the audience sure appreciate it. The ‘oldies’ are all sandwiched in a block with Elvis more enthusiastic about them than in later years and with the great addition of ‘One Night’ which amazingly is the last official live release of this song. You can ever hear that edge of the rocking/rawness of the ’68 Special’ here, so it is disappointingly that Elvis would drop the song after the November 1972 tour. Elvis has some real fun before ‘Hound Dog’ teasing the musicians by pointing out that, "Just because I’m asleep don’t mean that you guys have to be. I didn’t get up until 7.30" and proceeds to start, "You ain’t nothing but a woolly-booger, boo-boo, chug-a-lug!" – It’s cute. Compared to earlier live versions ‘Suspicious Minds’ seems routine (I am sure it was fantastic if you were there) and the dynamic range distorts on the high volume again. ‘My Way’ is performed after the quick band intros and is taken at a slightly faster tempo than at ‘Aloha’. This is a great debut version & Elvis’ performance sounds very involved & deliberate. Interestingly he doesn’t end the song with his usual power-ending but slides down the scale instead. The song obviously needed to be played to a devoted crowd and Elvis himself acknowledges, "Thank you very much. That’s a good song." ‘American Trilogy’ was first performed in January and although maybe nothing can beat the Hampton Roads version with that breathtaking scream, this is another gem. Taken at a nice slower tempo it is unfortunately let down by peak distortion at the very end. While Elvis heads on home to ‘Can’t Help Falling In Love’ there are more bonus delights in store. From the ‘At Full Blast’ Midnight Show of the same day we get a rare 1972 ‘Little Sister/Get Back’ which shows a great audio improvement on the original bootleg and cool guitar work from James Burton. There was also real luck in the tapes rolling for a very rare ‘It’s Over’. Before the song there is a cute adlib when a girl in audience cries out ‘It Hurts Me’, to which Elvis replies, "Well if it does, don’t do it!" Elvis actually suggests ‘It’s Over’ rejecting the idea of doing his just-released new single ‘Burning Love’. This seems strange as this would be his only performance of ‘It’s Over’ this season and, as far as I know, Elvis would only perform the song another 4 times ever, two of them being ‘Aloha’! A very tender, superb version. From the following Midnight Show Elvis sings an energetic ‘Proud Mary’. An ultimate ‘On Tour’ song, ‘Proud Mary’ really needs the power of playing to a big auditorium to be perfect. However this is a fine version and compared to it the Madison Square versions are very rushed. ‘Never Been To Spain’ is another cool and slow version but again suffers from irritating peak-distortion at the very end. This song was only performed in 1972 (except the 1974 Opening Night one-off reprise) and, after this performance, only 3 times more in concert ever. ‘For The Good Times’ would become very rare after this season and this is another highlight of this CD. At a slower tempo compared to M.S.G, this features an excellent orchestral arrangement and great playing from James Burton. The M.S.G recordings capture a vastly different audience interaction but here this really sweet & gentle version is one of the very best tracks. The CD rocks out with a great ‘A Big Hunk O’ Love’, another early 1972 version. This song would surprisingly be used for ‘On Tour’ but then dropped from the set-list for M.S.G and finally released on ‘Aloha’ the following year. The fabulous final morsel of ‘Tiger Man’ shows that Elvis still did mean business in 1972. On a side note- Elvis renegotiated contract for this season netted him $130,000 a week with The Colonel taking his usual slice. The crafty old Colonel however had also negotiated himself a nice personal salary $50,000 for generally ‘promoting the Hilton Hotel chain’. Nice work if you can get it! Verdict –While it is obvious that Elvis would perform better when properly challenged - ‘On Tour’, ‘San Antonio’, ‘Greensboro’, and ‘An Afternoon in The Garden’ reflect these great performances - there is still the genuine excitement in hearing a brand new recording which was never destined to be officially released. Elvis is in surprisingly good form for a 7th season Vegas Dinner Show and this is a great taster of Elvis working Las Vegas in Summer 1972 which is unfortunately let-down at several points by the audio distortion . Review by Piers Beagley, EIN. October 2005. 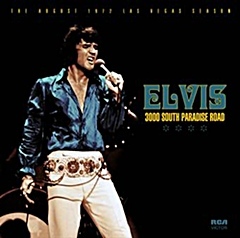 '3000 South Paradise Road' FTD CD Review: A 2012 two-CD release with 16-page booklet this FTD takes a close look at Elvis’ engagement at the Las Vegas Hilton in August of 1972. The main disc is the Dinner Show from August 12, 1972 and the second disc is culled from the rehearsals on August 4th, the date of the opening of the engagement. '3000 South Paradise Road' provides a unique experience of Elvis rehearsing, 6 hours before the opening night at the Las Vegas Hilton. August 1972 was a great period with Elvis out of those typical jumpsuits and looking cool in his two-piece suits. Created by true Elvis fans for Elvis collectors - and with the fabulous audio remaster of the fine August 12 Dinner Show - this is what the FTD label is all about. Click here to EIN's in-depth review of this new FTD release..